I can’t resist playing with an LED array, especially a surface mount one, so when I stumbled across some cheap (<$2) surface mount 8×7 LED arrays, charlieplexed onto 8 IO pins on ebay, I had to grab some. 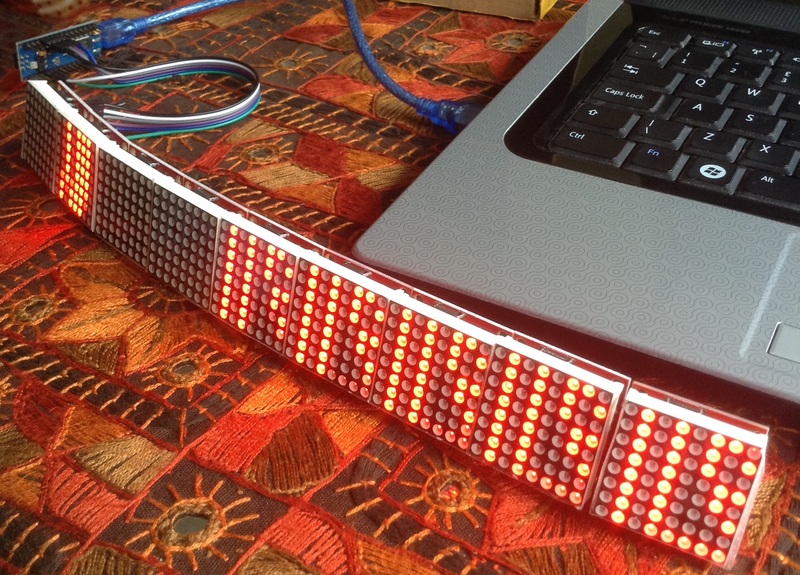 A wide range of LED matrix modules, shields and HATs for Arduino, RPi and so on. RPi Zero Scroll pHats from Pimoroni (which are great fun to play with). Adafruit Charlieplexed 16×9 LED martrix and driver (I don’t have any of these, but I’d like some!). 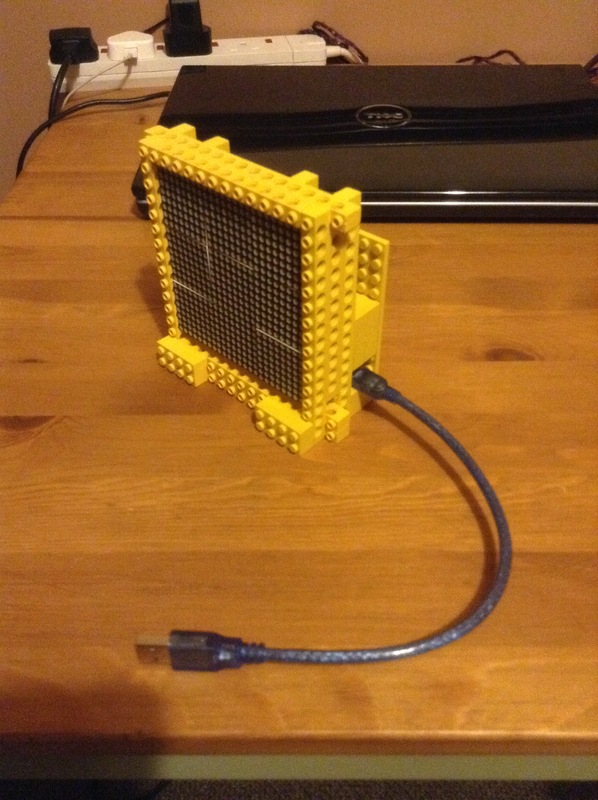 or you might even be lucky enough to find a Pi-Lite or LOL shield hanging around (I still have a few). But as I say, I can’t resist a surface mount LED board, so I started to play. When these arrived and I started poking around, I soon found out they were actually a cheap knock-off of the Sparkfun 8×7 LED Array, something I didn’t even know existed! 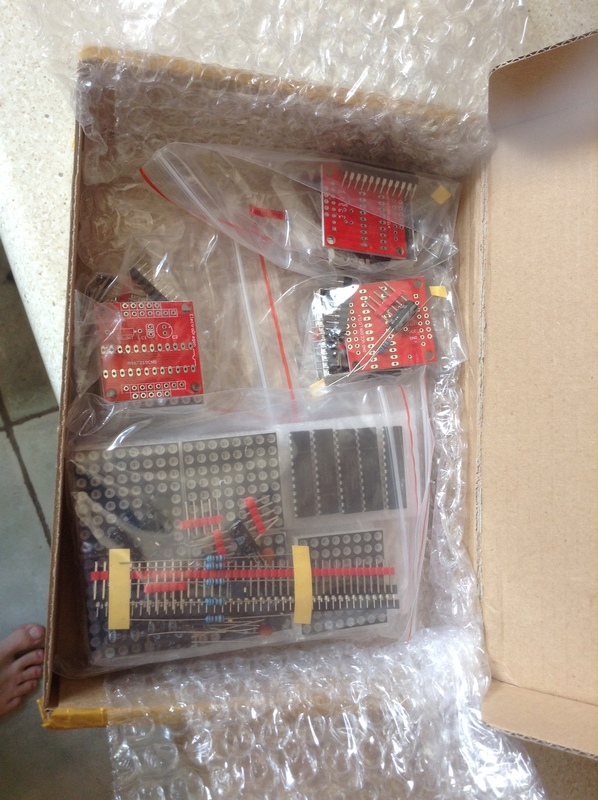 Apologies to Sparkfun for not getting an official board, but many thanks to them for open sourcing the design. Initially they are fairly easy to hook-up and drive. I used an Arduino Uno for my first experiments, as they could be paired straight away with pins 2-9 and then driven directly using the Arduino Charlieplex library (the Sparkfun Tutorial uses the Chaplex library and a special Sparkfun library for the board, but I was just doing fairly simple things for now). Using an IO expander – such as the MCP23017 (the subject of this post). 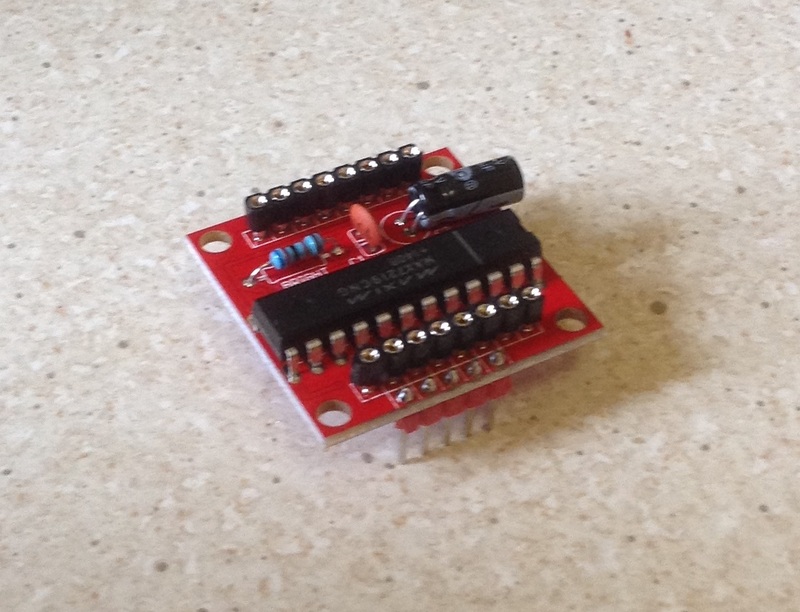 Using an Arduino Mini Pro – to provide a serial interface (bit more on that later). Using an LED driver module. For this first experiment, I thought having an I2C addressable LED module would be quite neat (I didn’t know about the IS31FL3731 used on the Adafruit and Pimoroni boards at this time – that is an experiment for another day), so I grabbed some cheap MCP23017 breakout boards and after breadboarding it, ended up simply soldering one on the back. It overlaps ever so slightly, but I think I could still place a few of these side by side to chain them. And the three connections with no header pins are the three address encoding pins. As I’m using I2C I only need four connections: VCC, GND, SCL and SDA (I could have left off the other three header pins really). In terms of the code, there are libraries for the MCP23017, Charlieplexing and even the aforementioned Sparkfun library for this module, but to link them all together is quite inefficient. The simple approach would be to replace the low-level pin setting/clearing code in the charlieplex library with commands for the MCP23017. But as every setting of a single LED, even when triggered as part of a ‘scan’ managing a display buffer, requires I2C commands to be sent over the bus, and each command requires bit manipulation to process the IO pins individually, this is massively inefficient. However, the MCP23017 is really only be driven by two registers: GPIOA to set the IO pins HIGH or LOW, and IODIRA to set the pins to INPUT or OUTPUT. Recall that for Charlieplexing, all three states of pins are significant: INPUT, OUTPUT+HIGH, OUTPUT+LOW. To work out which pins do what, we need to refer to the wiring layout of the LEDs on the board, for which the Sparkfun schematic is key (my thanks again for the open source design). Here is an annotated version showing which IO pins (numbered 1 to 8 on the schematic) are connected to which LED in the matrix. The key thing to notice is how for every column listed, there is, naturally, a gap in the numbering of the rows (you can’t have an LED connected with both leads to the same IO pin). The basic principle being that for a single scan, set one pin HIGH/OUTPUT (for one column in the matrix) and then work out which other LEDs need to be active by setting the direction of the pins accordingly – LOW/OUTPUT will light the LED for that pin combination; INPUT will mean the led for that combination is off. Then on the next scan, do the same for the next column. The following is some basic code, based on a whole range of sources (and to be honest, not particularly well structured in terms of functional separation) to provide an I2C optimised scanning function for the MCP23017 and LED array combination. Usual caveats apply – I’m not really a cpp person, use at your own risk, etc, etc. You can set the I2C bus to run at a higher speed, which is well worth doing in this case. Note that I don’t know what happens if you have lots of things on the bus – this was working with just this LED array and nothing else. See Wire.SetClock() in the Arduino Wire library. You can’t do I2C from an interrupt routine. I wanted the scanning routine to run off a timer interrupt, but nothing works if you try to do that – in fact, everything actually completely locks up. So that’s it for now. It scans quite well and with not a bad refresh rate, but as I said right at the start, with so many options of LED array available, not quite sure why anyone would want to do this. Next, I’ll see if I can get the Pi-Lite firmware onto an Arduino Pro Mini and solder that on the back of one of these too. That will create a standalone, drivable over serial port, module similar to the original Pi-Lite (ish). Not really sure why anyone would want to do that either. * to an MCP23017 IO expander chip and accessed via I2C. // Define the pins in the order you want to address them. //       sequential, depending on the setting of IOCON[AB].BANK. // by the master and the slave will be triggered by it. // The default is 100kbit/s (standard); many devices will also support 400kbit/s (full speed). // Some might support 1Mbit/s (fast mode) or 3.2Mbit/s (high speed). I’m still playing around with using the ATtiny85 as the basis for a synthesizer, using a range of code and circuits from the Internet, but had an irritating problem today with some open code. The author describes complete build instructions for their code and circuit for v1.5.7 of the Arduino environment and the arduino-tiny library, which as far as I can see was last updated in 2013 from its google code repository. But I have v1.8.5 and the now easy to use, built-in support for the ATtiny85 from David Mellis (https://github.com/damellis/attiny). Which is obviously a linker error, but it has proven quite difficult to find a detailed hint as to what the actual problem is. It says that it has redefined in my .ino file, but wasn’t immediately obvious this related to interrupt routines (although the word vector should have been a clue I guess). And in any modern Arduino core timer 0 is used for the millisecond timer, as defined in hardware/arduino/avr/cores/arduino/wiring.c. This is indeed vector 5 (see http://ee-classes.usc.edu/ee459/library/documents/avr_intr_vectors/). This is defined in wiring.c, but not directly related to the delayMicroseconds function (oh the joys of tracing C linker errors). I’m skipping over the part where I was attempting to work out where the actual source code being built was stored – not in <program files>\Arduino; not in my own Arduino source area; no it was finding mention of <user>\AppData\Local\Arduino15 that found any ATtiny support in my installation at all. There seems quite a lot of confusion online (at least from the searching I was doing) about timers on the ATtiny85 and the Arduino environment. It looks like an earlier version of the Arduino core (although not obviously in the v1.5.7 suggested by the author of the code I was using, so that is still a puzzle) had a method for changing the timer usage for different microcontrollers. However, this isn’t in the latest builds of the core or in the version of the ATtiny core support I’m using, which doesn’t seem to have the option to change which timer is used for the delay functions. In fact, I couldn’t quite pin down when the use of this header file disappeared from the Arduino builds, but to be honest I didn’t spend ages looking. The code I’m trying to use needs the use of both timers, and as there are only two timers on the attiny85, hence the clash. I’m not totally clear why it builds when the delay timer is swapped to use timer1 (as in the older arduino-tiny core), but I guess the code isn’t hanging an ISR of the other timer. So whilst you can completely mess up the functioning of the timers in your own sketch, by changing the control registers and so on directly, I haven’t found a way to clear and attach a new ISR to the interrupt. I need to dig around a bit more now into the internals of the ATtiny timers to see how the code might be modified to support timer 1 instead of timer 0, but that will have to be a job for another day now. Anyway, the upshot of all this is that this took quite a lot of untangling and googling and following dead-ends, so if you know of a definitive resource or document that details the history of ATtiny85 support within Arduino and when this changed, I’d like to hear about it! Update: In my case it turned out that I was pretty much able to replace the use of the Timer 0 overflow interrupt with the Timer 0 compare A interrupt and get largely the same thing. I don’t know if the two use of the different timers needs to be swapped though, but as far as I can tell right now, changing interrupt does remove the clash. Of course there may still be other side effects, but I need to dig into the details to see. I’ve been playing a little more with my icStation 4x4x4 LED Cube Shield (I described the details of the build and my code previously). First, a little hardware mod. You can see this simple mod in the pictures below. The other change I wanted to make was to make the cube more easily programmable, rather than just loading in pre-set patterns, and to make the refreshing of the cube more independent of the main code. To do the former, I added a few functions to set and clear the appropriate bits in an array that I can simply load into the cube when convenient. To improve the scanning of the cube, I decided to use the hardware timer interrupt available on timer 1 in the arduino. After initially thinking about setting the registers directly, I decided the TimerOne library is actually so simple to use, I may as well just use that – so I did. Note that for each tick of the timer I display one plane then move onto the next one for the next tick. Initially I had it setting each plane in sequence, but then found I needed a short delay between each plane to actually allow the LEDs to illuminate without bleeding into each other, hence splitting it up. I also found that if I don’t pre-set all four planes to HIGH (i.e. turning them off) before selecting the pattern I wanted, I’d also get some bleeding of values across planes, hence the sequence: a) turn all planes off; write the 16 bits to the plane as data; turn on the plane to be illuminated; wait before doing the next plane. This seems to create a nice scanning persistence of vision effect without having to worry about when to trigger the scanning from the main code. The last bits of glue are something to update a buffer containing the pattern to display (stored in LED_Plane[0-3] in the above code) and pretty much the same code as before for the actual writing to the registers of the 74HC595. Which was starting to drive me crazy as I could see the library was installed correctly, etc. After some Googling, eventually searching for “Arduino use of libraries from other libraries” or something like that, I found out that the compiler won’t include paths to libraries unless they are included in the main sketch file. Consequently to use <TimerOne.h> in my .cpp I also need to #include <TimerOne.h> in my main sketch file too. A quirk of the “C++ but not quite C++” nature of the Arduino IDE I guess. // Note: Original shield was wired to use pins 0-7, plus GND and +5V. //       radio and 8 is the radio 'enable' pin). //    second from top plane 1, then 2, highest plane 1, highest plane 2. //    Of course, if you wire the planes up differently, that is up to you! //    and  D8 = msb of the second value, D15 being the lsb of the second value. registers ... to the output pins"
I can’t resist a cheap LED matrix, so when I stumbled across these 8×8 LED matrix displays with a Max7219 driver LED in this chainable form-factor for, get this, less than £1.50 each from electrodragon.com … well, I had to give them a go. It is a relatively simple circuit board to build, so there are very minimal instructions, but there are still a couple of gotchas that might catch out a beginner, so I’ve put together these notes whilst putting them together. By the way, I ordered 9 so I could eventually form a 24×24 LED square (3×3 of the matrices). 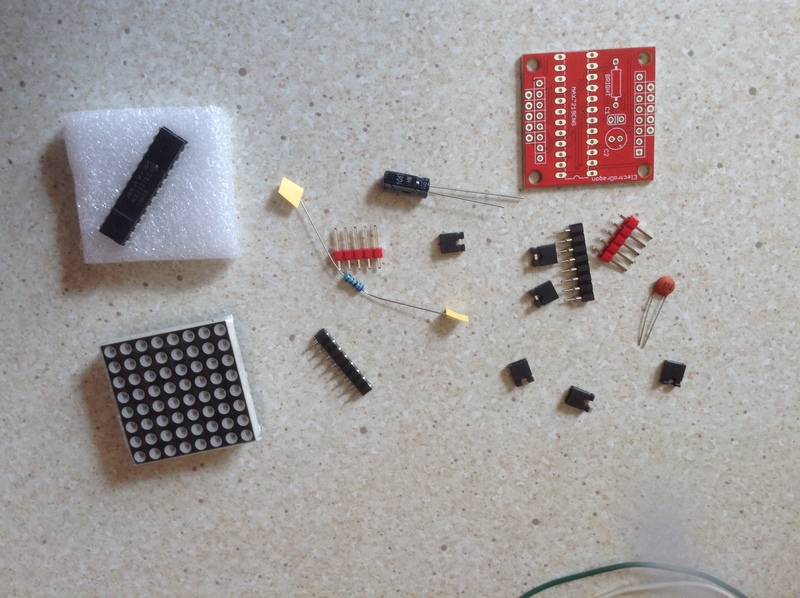 I started with the headers, then the discrete components, finally the chip. The only thing to note is the polarity of the electrolytic capacitor (of course – look for the + on the circuit board) and the orientation of the chip itself. Also note that ‘pin 1’ of the LED matrix sockets are indicated by a square pad in the top right of the circuit board (as seen from the top, with the writing the right way up). It is worth fiddling with the electrolytic prior to soldering to try to ensure it doesn’t poke out over the top edge of the circuit board – although if it does, if physically mounting boards next to each other, it will quite happily overlap into the next board. 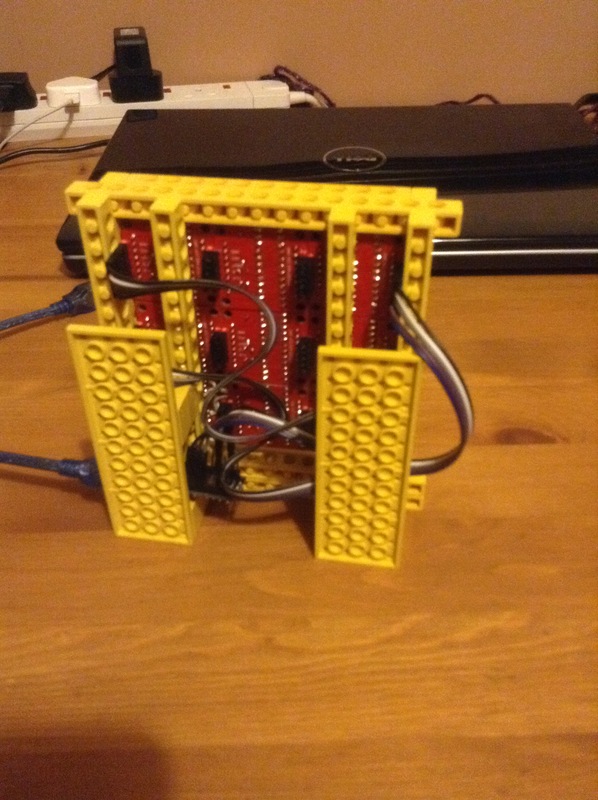 The design suggests that all the header pins face upwards and that the jumpers are used on the top of the board to chain them together. however, I didn’t really want to have to take off the LED matrix every time I wanted to change how it was linked, so I opted to solder the connecting header pins to the underside of the board as shown. It also gets around the issue they describe on the product webpage about the LED matrix not really fitting snugly on the board. Mine fits nice and tight. So all that remains is to add the LED matrix. As I said, pin 1 should be indicated on the matrix itself and is indicated on the circuit board by the square pad near the electrolytic capacitor. Of course when chaining with jumpers DOUT goes to the next LED DIN. The other pins pair up. There is a lot of arduino code for these types of driver chips – start here – http://playground.arduino.cc/Main/LEDMatrix. I used the code from here to test my setup – http://playground.arduino.cc/LEDMatrix/Max7219 – as written this assumes the same pinouts as I describe above (i.e. CLK, LD, DIN on digital pins 2, 3 and 4). (in my case) and get to work playing. The routines in the library provide a simple interface to setting rows on a single or all of the chained displays. maxSingle is meant for when there is just one display. maxAll displays the same value on all displays in the chain. maxOne will target a specific display (starting with display number 1 up to your last – 9 in my case). As you can perhaps see, this is using an Ardunio nano. With 9 boards cascaded, getting the PC to recognise the nano was plugged in was sometimes a problem – it often gave me a ‘there is a problem with your USB device’ error on Windows 7. It was fine with lesser numbers of matrices, so I guess there is a power issue with the nano struggling with the USB setup and initialising all 9 LED matrices at the same time. Temporarily disconnecting VCC from the LEDs when plugging in the USB seems to solve the issue for me. As I eventually want to be setting an entire row of LEDs in a larger grid, the maxOne function is a little wasteful as it has to shunt null values to all of the LED displays you are not targeting – so calling it 9 times means writing 81 bytes out across the DIN pin just to actually set 9 bytes. Consequently it is possible to optimise it a little if you want to write an entire row to all displays in the same transaction. Of course, if you refer back to the LedMatrix page, there are many other libraries that will do most of this for you, including Marco’s very complete library for scrolling text displays – http://parola.codeplex.com/ – but I quite like being able to see what the low-level code is actually doing to make things work. // Note: Sloppy code warning! //    // fill each byte of row with your data - row, row, row, etc. But I haven’t mentioned the absolutely best feature of these little boards yet. And that is that they are almost exactly the same dimension as a 4-stud Lego brick. This means it was trivial to make a simple enclosure to hold my 3×3 grid and the nano. I now have a really cool game-of-life running on my 24×24 LED grid. At this price, I have another 8 on order so I can take it to a 4×4 grid (with one spare).